The delicious taste of Carrot Cake with none of the guilt! Preheat oven to 350ºF. Line a 24-count mini-muffin tin with liners. 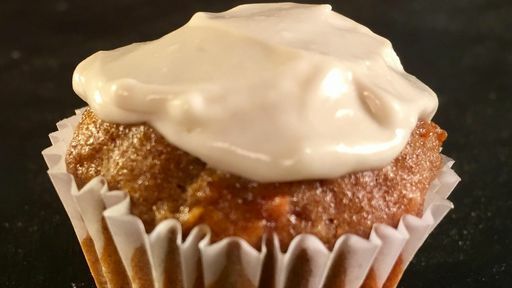 For the Mini Carrot Cake Muffins: In a large bowl, whisk together flour, baking soda, cinnamon, nutmeg, ginger and salt. In a medium sized bowl, mix together egg, oil, brown sugar, honey, vanilla extract, and applesauce. Add flour mixture to applesauce mixture and stir until just combined, taking care not to overmix. Gently fold in shredded carrots and raisins. In small bowl, toss the walnuts in 2 tablespoons of flour and fold into the batter. Pour batter into muffin cups, dividing evenly. Bake for 10-12 minutes or until toothpick pulls out cleanly when inserted into the center. Allow to cool. For the frosting: In the bowl of a stand mixer fitted with the paddle attachment, add the whipped cream cheese, vanilla extract, honey and whip until light and fluffy. To assemble: Using a small metal spatula or knife, frost tops of muffins and sprinkle with chopped walnuts. Serve. Tip: Can’t eat them all in one sitting? Freeze the muffins before frosting them for a late-night snack!